When winter breaks and water temperatures start to warm it’s time to consider early season trout fishing. Many anglers would ask, why? They are steelhead in our rivers that will probably bite better than resident brown and brook trout. The reason is that if you are a big trout hunter early season provides one of the best opportunities of the year to score on a big ole wiley brown trout. 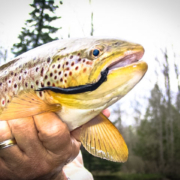 There are several reasons that I think Early Season Trout Fishing provides one of the very best opportunities to land a significant trout in Michigan. As the water temperatures increases so does the trouts metabolism. The urge to feed combined with the lack of insect activity creates an opportunity for an early season fisherman. The fish haven’t seen a lot of angler pressure since fall. That makes them a little less wary and making mistakes more likely. Water is usually still little high from spring runoff and will most likely still have more color. Makes it easier to pull bigger trout out of cover. All of these reasons plus the lack of angler pressure and my motivation to get out and fly cast to resident fish makes this one of my favorite seasons in Michigan. Water temperatures play a big role in early season trout fishing. When the temps are below 40 degrees we don’t usually see the biggest browns but we do get those mid to upper teen fish that always make for a good day. When the temps go above 40 degrees, this time of year will often produce a few really big fish for those willing to go on the hunt. Once the water hits 40 degrees I’m looking for those big game anglers that can take the risk and go hunt those browns that we never forget. Here are three tactics you can use for early season trout fishing success. First and foremost the best method for early season success is streamer fishing. 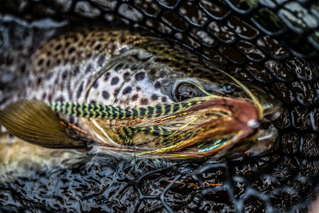 Streamers are a great tool for searching out and engaging aggressive fish. After a long cold winter trout will be on the search for food even while water temps are still on the cold side. Look for trout to sit in areas with darker bottoms trying to absorb any sort of thermal relief from their surroundings. It’s not uncommon for trout so sit in really shallow water during the colder periods of the day. So if your wading or using a drift boat, make sure to pay attention to the bottom. We have seen trout in less than a foot of water on several occasions. Chasing early season trout with a streamer is not a numbers game and we usually don’t find a lot of giants early either, but a common trout at this time on the Upper Manistee is 14-18”. It seems as this size class of trout is the most active during the early season. Make sure to have a combination of conehead or dumbbell streamer patterns and fish them with a slow jigging action around structure. The Hawkins Little Racal is a great place to start. While one of the hardest methods during the early season is Dry Fly fishing, it can be possible and very rewarding. 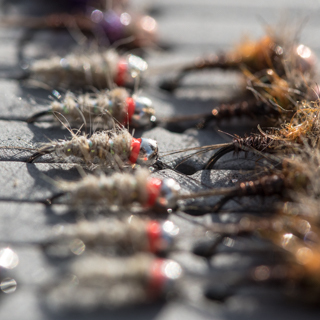 With the largest BWO hatches of the season occurring in the early spring, along with little black stones and plenty of midges, there is always a chance of some trout surface activity on any given day the bugs show up. Now midges work best in the tailwaters like below Tippy Dam. You can have a fun few hours in the afternoon midging for trout on bright sunny days on tailwater sections or on a cloudy day when the BWO hatches show up in numbers. Normally during the Early Season we carry two separate rods, one rigged with my streamer set up and one with an Floating Line set up. As we are drifting down the river, look for bug activity on the water and active fish feeding. On most days during the early season it is typical to only see a few heads rising per day within very short windows of activity on the surface. But if you capitalize on your opportunities it can be great fun. The little black stone is probably my favorite early season bug. The Stonefly loves to lay it’s eggs in a fluttering almost tantalizing manner. Flying just above waters surface and even in the film of the current, the little black stones can cause some pretty explosive eats by trout. This doesn’t happen every day, but having the rod rigged and ready for action has brought a few nice early season trout to hand. spawning steelhead or spawning suckers can be great fun. With Spring Steelhead in the peak of their spawning run trout will gorge on eggs and dislodged nymphs behind active spawning areas. 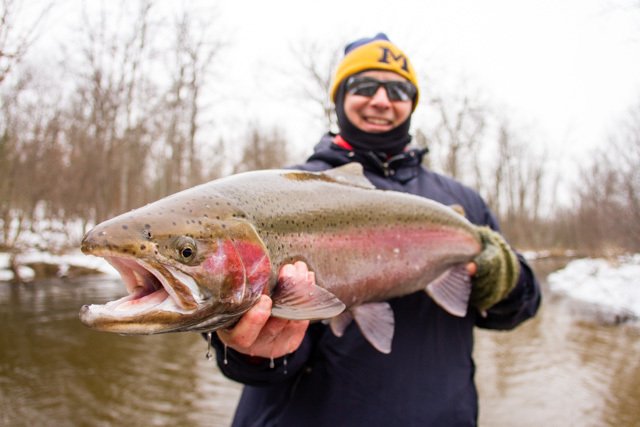 While we are big on letting steelhead spawn, fishing the dark water for trout can be very productive, especially on the Pere Marquette River where this has been a staple of the spring program for years. Now if your thinking about nymphing for trout above the tailwater’s be ready to lose a few nymphs to all the wood that lines our Northern Michigan trout streams. With the amount of wood around keep your nymphs selection simple. Don’t spend lots of time either tying or buying elaborate nymph imitations. Instead try running nymphs like Pat’s Rubber Legs and smaller Squirmy Worms, espically in tandem with a small bead head pheasant tail or hares ear and you will do just fine. When trout are not chasing streamers or conditions are not right for the bugs to hatch, trout will have to eat something. Nymphing the runs can be the most productive technique for the utterly slow times on the water. Here is an early season trout tip: while nymphing, focus on the gravel areas more than the deep sandy pits as aquatic life in the gravel runs is more active earlier in the season. Many of our best rivers like the Manistee, Pere Marquette and AuSable River’s are open all year so that’s a good place to start. A favorite of mine is to hunt big trout with streamers in water that also has steelhead present like the Manistee River below Tippy Dam. That gives you two bites of the apple because steelhead, especially drop backs, will eat streamers. Many times I’ve scored both on big browns and steelhead fishing streamers in the same day. If you are motivated to get out and cast a fly line and looking for some excitement give Cherie a call at 231-228-7135. I’m sure any of the Hawkins guides would love to chase trophies with you. I am excited to announce a new partnership with Montana Fly Company and myself. I have recently released several new dry fly patterns from my arsenal. They are now available through Montana Fly Company this year. It’s been a while since I have put anything new out there. The flies that are included in the two series I have released are mainstays in my arsenal. They are for the Isonychia, Brown Drake, and Hex hatches and have provided countless memories for our customers. The flies are all foam based Mayfly patterns designed to imitate the Isonychia, Brown Drake, and Hexegenia species. You can fish them all day with some realism and an impressionistic silhouette fish can’t resist. The Isonychia hatch is one of our best and most lengthy hatches of the season. 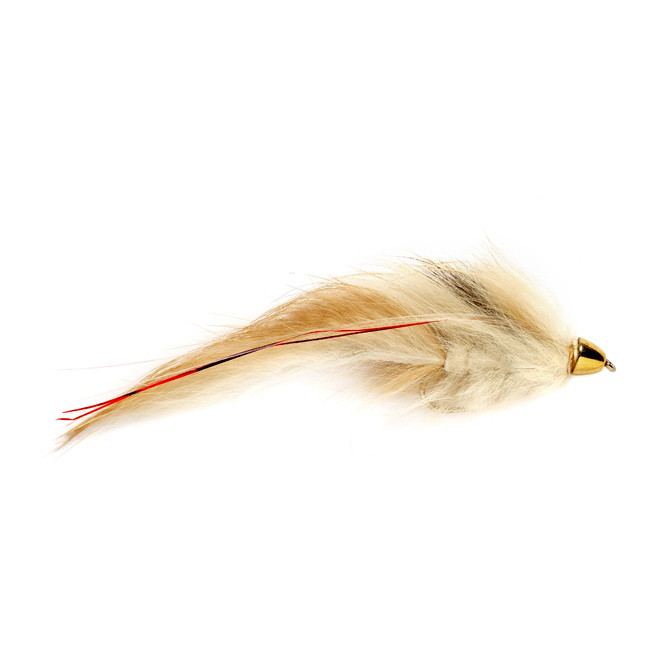 This fly is designed, much like the name, to be fished all day! It has a very realistic profile and is a great fly to fish over rising fish. This is also a great searching pattern throughout the day with or without actual bugs on the water. This one is a must have!! This fly just looks crazy on the water! Like the name, the Boondoggle Isonychia has a “fishy” profile and just flat out hunts . It often creates some chaotic moments of intense excitement. 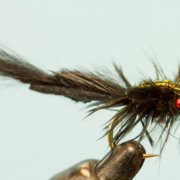 This fly is more of a searching pattern that has a silhouette that will get the fish looking up with or without bugs on the water. Once the Iso hatch gets started, the fish are always looking for it. Brown Drakes on our home water of the Manistee are often a complicated puzzle, often leaving you scratching your head. We commonly refer to this hatch as the “Great Houdini” hatch as it can disappear for days and then suddenly reappear in epic fashion. This fly fishes great with bugs on the water, but I will do just as well fishing it blind during the Brown Drake season. 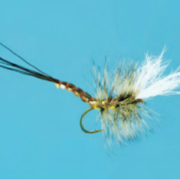 This fly was designed to be fished blind or over rising fish. It fishes well even during the rare daytime emergence that we will commonly see a few times each season. This is also a great pattern during the spinner fall especially on the cooler evenings when they spin early. Like the Isonychia version of this fly it has a very fishy appeal to it. I have fished it during both the daytime emergence and more typical evening timeframes and have had success with it in both situations. With the white calf tail wings it is easy to track in the low light periods and floats like a cork! It gives me all the confidence knowing my fly is still fishing even when I really can’t see it. The Hex hatch is truly the busiest time of year on our waters. I wanted a fly that I could fish that was different from anything else. I wanted a fly that would work during the day and night, but more importantly when it was bright and no bugs to be seen. This has been my best daytime Hex pattern for a while now. When you get a rare, but not too uncommon daytime emergence, yeah…..this is the one! The Hex version of this series is where the template all started for me. The original versions were getting smashed in the evenings well before the hatch would start and then again after the bugs disappeared while fishing blind and hunting for sipping fish in the dark. I love this fly, it just flat out hunts!! It was so good over a broad spectrum of circumstances that I had to have it for the Iso and Drake hatches as well. Thus began the evolution of this series. Check with your local fly shop for availability. If you can’t find it drop us a line and we will help to get these patterns in your hands. Look for more to be coming out in the near future as I have expanded on some old favorites and I am constantly tweeking new stuff and expanding on my boxes. Good luck fishing this season and I am looking forward to the upcoming trout season and some summer like weather! One of the most important parts of your fly fishing gear is the fly line. Having the correct fly line for spring fishing conditions is not only important to catching fish, but can relieve some of the hassle. We are blessed and cursed to have fly line manufactures developing so many speciality lines for anglers. This is great when you’re targeting a specific species at a certain time of year. The downside is a curse for the wallet and trying to organize your fly line closet. 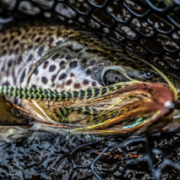 If you’re fishing this spring for either Trout, Steelhead, or Pike here are three of our favorite fly lines for Spring Fishing. Spring Streamer fishing is one of the best times to target trout with a streamer. 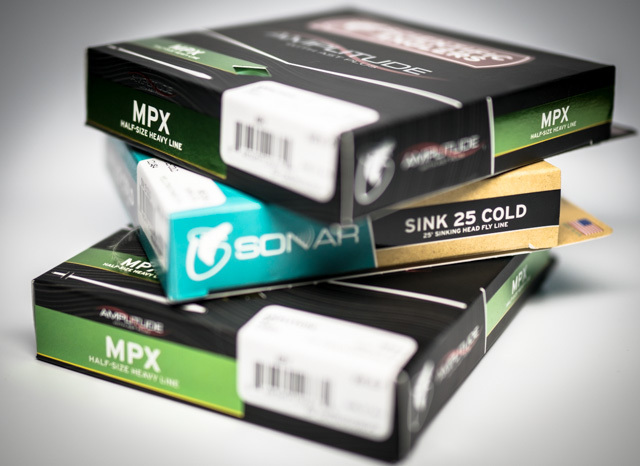 Two sinking fly lines that you should be aware of are the Sonar Cold 25 and Sonar Cold 30. Both are great for fishing in Michigan because of the braided multifilament core inside the fly line. This is the mot supple core used by Scientific Anglers. As a result it allows the line to remain tangle free under the coldest conditions. Braided multifilament cores are also great in floating line applications as it has a hollow core which aids in flotation. How many times have you heard the phrase “don’t stop moving your streamer”, when streamer fishing? It’s an interesting phrase and there is it a lot of truth to it for a lot of situations. 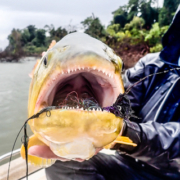 However, there are always “exceptions to the rule” as multiple other scenarios might play out in your fly fishing career where you’re going to want to stop moving the fly to have success. 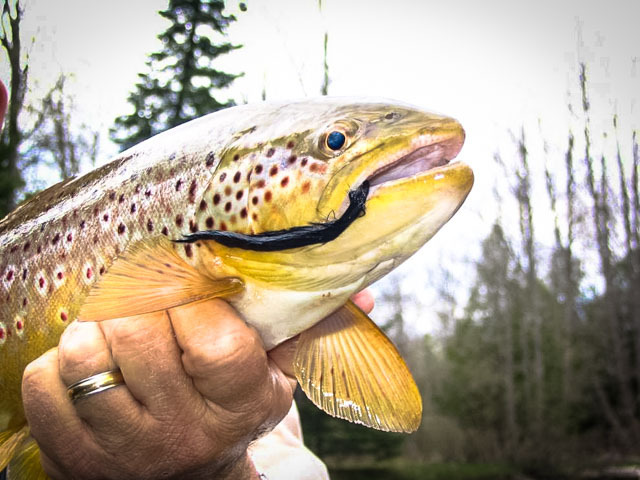 Spring streamer fishing season in Northern Michigan is just around the corner so let’s dive into some of the situations that might play out for you while stripping streamers on Michigan Rivers. 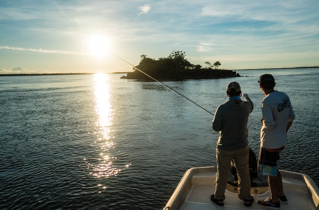 Like most things in fly fishing, there’s always an exception to the rule. No matter how rare the exception, a fly fisherman should always be willing to experiment when traditional tactics aren’t producing. Now let’s break down the “don’t stop moving your streamer” phrase based on species. To be a really good streamer fisherman you need to have a well rounded streamer game. Meaning you better be able to fish for multiple species, i.e you want to become the Bo Jackson of fly anglers. 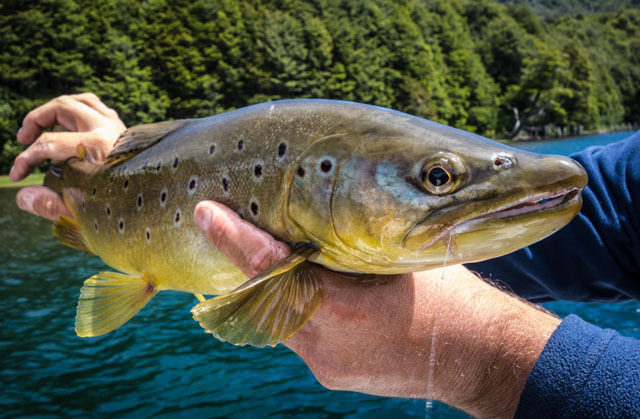 Trust me, having as many experiences as possible is going to make you a better angler even if the only thing you want to catch is Brown Trout. Trout especially, Brown Trout, are prime targets to a streamer presentation. During the spring one of the most important factors to pay attention to is water temperature. For example, if water temps are still in the 30’s stopping your streamer pattern can be really effective. I’ve had some of my best streamer days on cold rainy days while barely moving the fly, almost vertically jigging the fly back to the boat. Keep in mind how water temps can affect trout behavior and then change your presentation to match the conditions. When jigging the fly it’s important to stay in contact with your presentation as the bites are usually soft. Make sure to maintain control of your slack line and keep your rod tip low when not moving the fly. 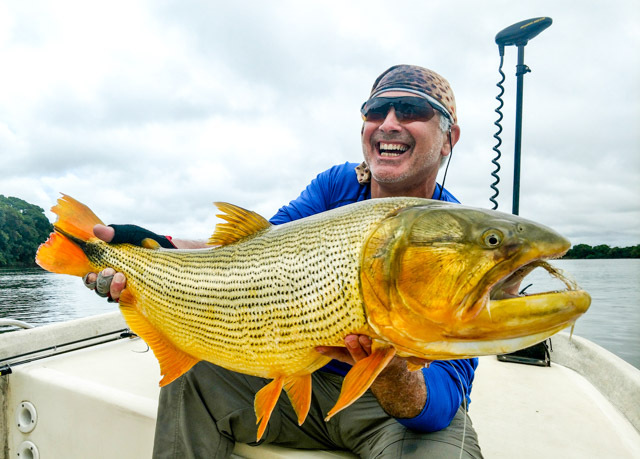 Use flies like Russ Maddin’s Circus Peanut or a variety of conehead patterns that sink faster. I really like Tungsten cones in this situation as they sink really fast. If a trout misses the bait for sure pause it/stop the fly. If you see them swiping at it half heartedly trying to “kill it” and if they don’t bite it on the stop they will most likely eat it when the fly takes off again. Trout will bite on a steady retrieve but the twitch and pause seems to bring more bites for me. The US Forest Service has decided to not implement the ban in 2019 but instead has agreed to let local authorities address the problem in 2019. They have reserved the right to implement it in 2020. It seems obvious that they have bowed to pressure from the merchants. 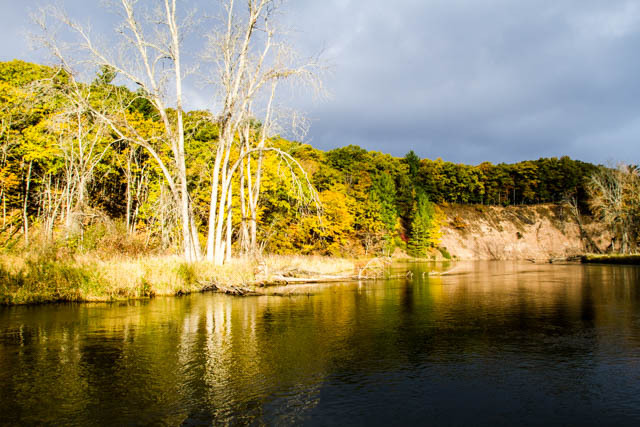 Alcohol is no longer permitted on parts of three of our favorite rivers in Northern Michigan. All are within the Huron-Manistee Forest. 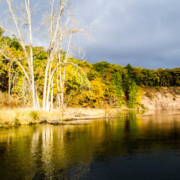 This new policy affects the National Wild and Scenic River sections of the AuSable, Manistee, and Pine rivers. The Huron-Manistee National Forests announced the decision recently. “This closure order is intended to address persistent public safety issues and protect natural resources on rivers of outstanding recreational value,” said Huron-Manistee National Forests Supervisor Leslie Auriemmo. In Norther Michigan the AuSable National Wild and Scenic River begins below Mio Pond and extends to the upper end of Alcona Pond. It makes up 23 miles of the 138-mile waterway that runs through Northern Michigan and enters Lake Huron. The Manistee and Pine National Wild and Scenic Rivers are each 26 miles with the Manistee section running from Tippy Dam to the M-55 Bridge. This order will remain in effect throughout the summer recreation season, which runs from May 24 to September 2. · Pine River between Elm Flats and Low Bridge. Private lands, developed campgrounds, and designated campsites within those river corridors will not be affected. Violation of the order is punishable by a maximum fine of $5,000 and imprisonment for up to five years. This will not effect the fishing, should only make the weekend experience even greater with some of the silliness now being eliminated. While we all enjoy a few cold ones from time to time, please keep this in mind this summer and save yourself a hefty fine. Last spring, I was fishing below Tippy Dam throwing streamers for trout. There were lots of bank anglers fishing spawn sacks and a lot of heavy pressure from boat anglers. The trout were refusing most of our offerings of big streamers and we hadn’t had any steelhead activity. It was a sunny day which usually spells tough times in Michigan trout fishing. That’s just what we were having. As white is a go-to color in sun and olive and white is the most productive color combination that I’ve experienced, I tied on two Little Rascals in those colors for my clients to change things up. Fifteen minutes later we had landed a gorgeous steelhead that darted out from a mid-stream logjam and devoured the fly. Shortly after that we landed that a 4.5 pound brown trout. A star was born. How come a smaller streamer worked for big fish when big streamers usually get the job done? 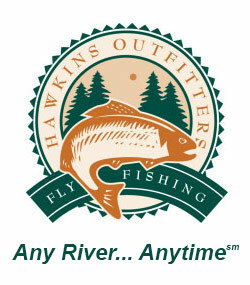 At Hawkins Outfitters, we fish streamers almost everyday in early and late season because they do catch big fish. Along with my pattern, the Nutcracker, we throw a lot of large streamers that entice big predator fish. But, those same large trout and steelhead see a lot of big streamers and, I believe, grow wary of the same big patterns they see over and over again. Even the best big pattern can start to produce fewer fish if fished too much or too often. Trout key on different sizes and profiles. Some days it’s four inch sculpins, other times it’s smaller leech or lamprey profiles. That’s why I created the Hawkins Little Rascal. It’s a smaller, slimmer pattern, that imitates leeches and lampreys well. Plus, it has a great, lively movement and action in the water. I tie the tail with rabbit strip to get that movement that trout love. Combine that with the conehead and you get that all-important jigging movement that predator fish often can’t pass up. Plus the conehead gets the fly down better in deeper and heavier water. We don’t just fish Little Rascals in the spring. You’ll find that you’ll have luck with them year round. You’ll get the best results if you vary retrieves and colors depending on water temps and sky color. When fishing colder water, use a slower retrieve than you would fishing warmer water. The fish’s metabolism is down and the fish themselves are slower at these times and will travel less distance to feed. If your streamer is retrieved more slowly, the fish will see it better and be able to strike. As the water warms, you can quicken your retrieve. As far as color goes: on dark days use dark colors and on bright days use bright colors. However, there are a couple times that the Little Rascal is a good imitation for a natural food source. In spring there are two food sources, lampreys and salmon fry that can be imitated by a Little Rascal. When you start seeing lampreys on the trout you are catching try a black Little Rascal on cloudy days. I’ve had some great success doing this. When fishing where salmon and steelhead hatch try a small white Little Rascal, it works well. You can fish the Little Rascal in any water conditions except when the water is extremely dirty. Then, you’ll want to stick with a larger streamer. You can also use it for just about any freshwater species. I’ve caught brown, rainbow and brook trout; king, pink and Coho salmon; plus small and large mouth bass on the pattern just this year alone. One of the fun things about owning Hawkins Outfitters is hanging around and trading information amongst the Hawkins Guides. Jon Ray, Ed McCoy, Jeff Topp, Russ Madden, and Steve Pels are some of the fishiest guys I’ve ever known. We constantly exchange information, fish locations, new patterns and techniques etc are community property. The Little Rascal 2.0 is a result of that sharing. As new materials come along or different tying techniques are learned it is a good thing to look back at some of our patterns. Jon Ray did just that with an old standby of mine, the Little Rascal. What he created we now call the Little Rascal 2.0. Jon made two big changes to the fly. First he added a vertical mono loop in the rabbit tail to reduce the instance of the tail fouling around the hook. This is a dynamite idea that will be incorporated into all of my rabbit tail flies in the future. The second addition is a dubbing brush palmered up the body along with the original rabbit strip. You know Jon Ray he loves flash! These two changes are fantastic additions that create a better fly. Less tail wrapping on the hook and a bulkier body with more flash makes this good fly even better. Thank you Jon Ray. Watch the video blow to see how to implement these changes and tie yourself some 2.0s!! Shortly after the Christmas holidays ten of us took off from the USA and headed to Argentine Patagonia. Our airport destination was San Marin de las Andes. Our ultimate goal was to arrive at Spring Creek Lodge in Junin de los Andes. As a result we would spend the next eight to eleven days pursuing brown, rainbow and brook trout with mostly dry flies. We were there for dry fly fishing in Patagonia. 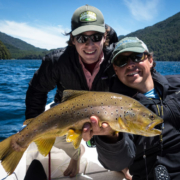 Our host, Gustavo Heibaum, owner of Andes Drifters assured me when we booked this trip that we would be in the middle of the best part of the season for dry fly fishing in Patagonia. Above all we should experience the fabled dragonfly hatch! Our group consisted of three couples and four single men including my son, Zach and I. The group was mostly comprised of very experienced anglers except one wife. Above all she was coming to both increase her fly fishing abilities and enjoy some non-fishing activities. 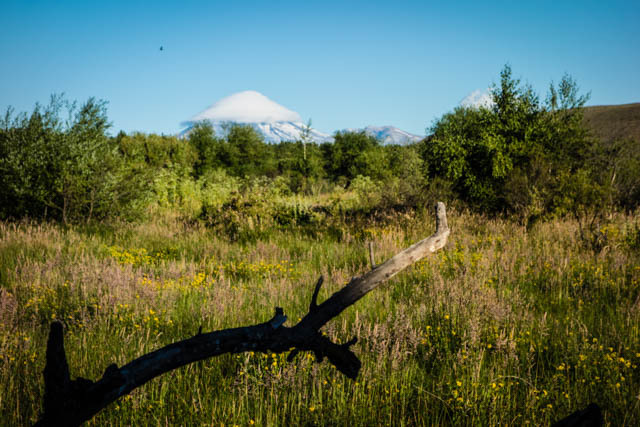 The location of Spring Creek Lodge near Junin is ideally central to a lot of very well known lakes and rivers in northern Patagonia. Famous rivers abound in the area. The Rio Chimehuin, Malleo, Collen Cura, Alumine and Calefu are all within a reasonable driving distance. Lago Troemen, Lolog and Lacar have great dragonfly hatches and big numbers of very good sized trout. Over the next ten days some or all of us fished most of these waters. As mentioned earlier, this is dry fly time. Consequently I couldn’t get much response on streamers. The fish were just plain looking up! Broke everyone’s heart…not! When dragonflies were hatching, those imitations were the ticket to success. The number one pattern was Gibson’s Dragonfly an Orvis bug. On the rivers and in the lakes with no hatching dragonflies the usual top dry flies were Fat Alberts in Black, Brown and Pink. The PMX in large sizes 4-8 tied either in a Royal or Peacock bodies produced a lot of fish. After these two the Chubby Chernobyls in a variety of colors was hot. In other words these three flies were the only dries needed 95% of the time. Dry fly time meant six weight rods were the stick of choice. We had more than average wind many days. This was more than we would normally expect. However even with the wind, most of us stayed with the six weights and fought the accuracy issues. While difficult at times we still managed to catch a lot of trout. 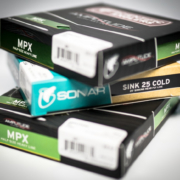 The line of choice for most of us was Scientific Anglers Amplitude floating line. It’s a half a line weight heavier than normal. It did a great job fighting the wind and turning over those big flies. The Calefu and the worm! We were lucky enough to able to fish the Calefu, it requires a two or three -nights camping trip. It runs almost entirely through private property. The Calefu can only be floated in spring or fall as it drops so low that you can’t get rafts through during the summer months. Firstly, it’s a superb trout stream with lots of pocket water in the beginning half. Secondly, the allure of lots of trout and the natural beauty of the river and it’s surroundings make it one of the best floats in the area. Massive rock out cropings look down on you while you are throwing dry flies to trout up to twenty-two inches long! In other words it’s a little slice of heaven! In addition to having this water available we were lucky enough to hit the beginning of the worm hatch. Small chartreuse worms congregate on the willow trees along the rivers and devour their leaves. In slower stretches these little worms provide great protein to cruising trout. Plopping a worm in to slow water will usually cause a trout hunting worms to turn and come to the offering. 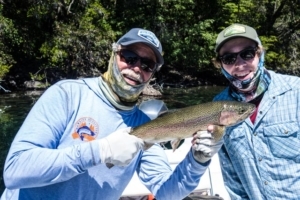 Browns and rainbows of significant size can be had by fly anglers. This trip was the second time that I’ve had a guest that took advantage of the non-angling opportunities that Gustavo offers. For example our guest rode horses and had a private workshop with a world renowned photographer. She kayaked, hiked, got tango lessons, learned about Argentine cooking, and visited art galleries. Along with that she mastered a fly rod and caught a bunch of trout during their 9 day stay. Argentina isn’t just about fishing! In conclusion after having spent forty plus weeks chasing trout in Patagonia, this time frame was the very best I’ve seen for the dry fly angler. 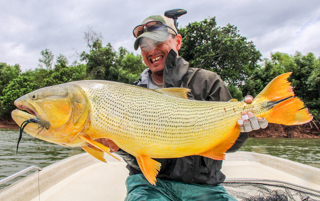 Andes Drifters has been my choice for at least a half dozen years as the very best outfitter in Northern Patagonia for the discerning angler/ traveler. If you have Patagonia on your bucket list let Hawkins Outfitters and Andes Drifters design a program for your specific wishes and desires. You’ll be happy you did! Steelhead are cold-water critters. Steelhead anglers need to learn how to Stay Warm during the Winter while chasing them. Steelhead can be caught all winter long in water temperatures as low as 33 degrees. Steelhead will feed all winter long, fight extremely hard when hooked and don’t seem to give a damn how cold it is! As cold bloodied animals, steelhead have that advantage over warm blooded humans. To be a successful steelheader you need to learn to deal with and be comfortable in the cold. Steelhead season lasts almost 6 months, and some of the best fishing is during the dead of winter. In pursuit of warmth start with base layers. It’s hard to beat capilene or Patagonia’s capaline Air which is half merino wool and half capaline. I wear one or two of the thinner long sleeve crew and long johns versus thicker singles. It seems to keep me as warm as the thicker versions but is less bulky, more comfortable. On my feet I use a thinner wool baselayer sock followed by a thicker wool sock. About your feet, if you are fishing from the boat, which is what we do most of the time, waders and wading boots aren’t your friend. Bigger, insulated boots are the best. We wear calf high Boggs or Muck boots that are heavily insulated. Snow pack boots will also work well. If you are wading, boot foot waders are warmer than stocking foot waders and wading boots because they aren’t as tight and allow better blood circulation to your feet. You actually want blood and air to circulate around your feet. It helps keep them warm. Also when wading don’t wear felt soles. Snow builds up on the bottom of your boot into a big ball. Wear the rubber soles to avoid this. A great option for non-felt wading boots is Patagonia’s Tractor Boots featuring aluminum bars on the soles for traction on rocks and in muck. I wear these boots on the Garden River, they are fantastic. My next layer on the bottoms depends on temperature. If it’s below freezing I wear Patagonia’s Nano Puff pants or the Patagonia Snap T Fleece pants ,a very warm option as well. If it’s warmer I’ll wear just an average pair of wool or capilene pants. On the upper half of my body, after the baselayer, I move to all wool, usually a medium weight wool zip front crew, followed by a wool hoody and finally a Patagonia Nano Puff Hoody. If it’s really cold I have a light weight wool hoody that I’ll add into the layers. Wool and down are natures greatest insulators. Wool will keep you warm even when wet. The latest and greatest wool is Merino wool. It isn’t itchy when next to your skin, it’s very soft and comfortable. I buy almost anything that I need in wool if available. One of Jon Ray’s new favorite items for those extremely cold days is the New Extreme Core Tops by Simms , the built in Ergonomic hood and integrated neck gaiter really keeps your upper body warm in the coldest of days. I do not recommend this item if your going to do alot of winter walking though. It’s too warm of an item, great for long days in the boat only. But if your breaking trail you will over heat. The exterior layer has to protect me from two things, wind and rain/snow. There are a variety of bib/jacket combos that Hawkins Guides have tried through the years. Orvis, Simms and Patagonia all make a variety of insulated outfits that work. Personally, for the last five years I’ve been wearing Gill sailing bibs and my Simms heavier rain coat. I look at the exterior layer for wind rain protection not insulation, I’ve covered that underneath. If you are wade fishing your waders and a good quality rain jacket will protect you from the elements. Either way black clothing is best in a cold weather situation. It absorbs more heat and is less visible to fish than bright clothes. On my head I wear a wool or synthetic beanie type hat on top of a normal billed hat so that my eyes have sun shield and my ears and head are kept warm. Then I can pull the aforementioned hoodys up over the beanie for additional warmth. A Buff or some type of warm gator around your neck between your shirt and chin is very comfortable when its’ cold. It should be capable of being pulled up over you nose, nice when the wind blows! 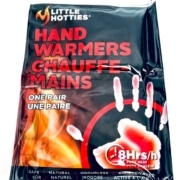 Hand warms are a must have on Winter Trips. can find, currently Simms Wool Gloves are my personal choice. Inside that glove I have a heater pack in each hand. In addition I have another heater pack in each coat pocket that I can hold in my hand when possible. Also a heater pack in your boots is a warm, comfortable thing on colder days. I also carry a small towel to dry my hands that get wet from handling the line while fishing. Side note, the fingerless gloves with the pocket flap are not good. You will lose fish when line warps around that flap. Finally a pair of thick mittens, I use ice fishing ones, can be put on when we are running from spot to spot to take the edge off when not fishing. The mittens are also good to have when wading. 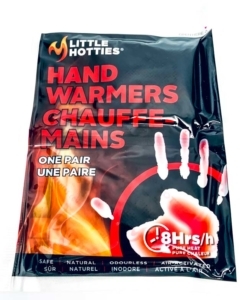 You can put them on during a break to help warm your hands. Steelhead are a fantastic gamefish, beautiful, strong and a prize worth pursuing. You’ll enjoy the pursuit more if you are comfortable in a steelhead’s favorite weather, cold, wet, and miserable. With today’s modern materials there is no reason to be cold. Be prepared, you’ll be happy you are!